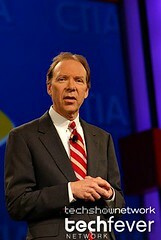 Dan Hesse, President & CEO Sprint Nextel Corporation during his keynote presentation at CTIA WIRELESS; Las Vegas; Nevada. 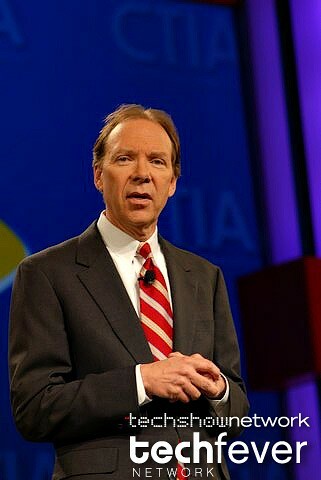 IMPORTANT NOTE: This photograph represents a low-resolution version of the original image. © Copyright Jochen Siegle/TechShowNetwork. This photograph is licensed for use under the Creative Commons BY-NC-ND license. It is OKAY to use this photograph on the web in compliance with the CC BY-NC-ND license, HOWEVER you need to link the image back to TechShowNetwork.com (http://www.techshownetwork.com) and GIVE CREDIT as "Jochen Siegle/TechShowNetwork". Do NOT remove the watermark. Please contact via email to jas@momentimedia.com to inquire about licensing for other usages or higher resolution of this image or to order prints. All other rights reserved Jochen Siegle/TechShowNetwork. The TechShowNetwork is a MomentiMedia publication.